A totally asymmetric simple exclusion process (TASEP) is a paradigm model in nonequilibrium statistical mechanics. It is a lattice model in which particles hop into a one-dimensional lattice from the left with rate , jump along the lattice to the right with rate 1 and exit from the right with rate . Only one particle can occupy a site, and particles can only hop into empty sites. The model is known for exhibiting phase transitions even in one dimension between low-density, high-density and maximum-current phases. •et; The entry and exit rates and specify how fast particles enter the lattice from the left and exit from the right. These values can in principle be anything larger than zero, but in this Demonstration they have been restricted to values between zero and one because the model behavior is essentially the same for any . •et; The length of the lattice. Larger lattices take longer to simulate. Recommended values are sites. Many interesting results have been obtained in the limit of infinitely large lattices. Some of these results (e.g. average current versus and ) will be well reproduced already for ; others may require larger . •et; Simulation speed. This is the number of iterations of the algorithm before the next animation frame is generated. Recommended values are . Large values will speed up the simulation but can also cause it to hang. 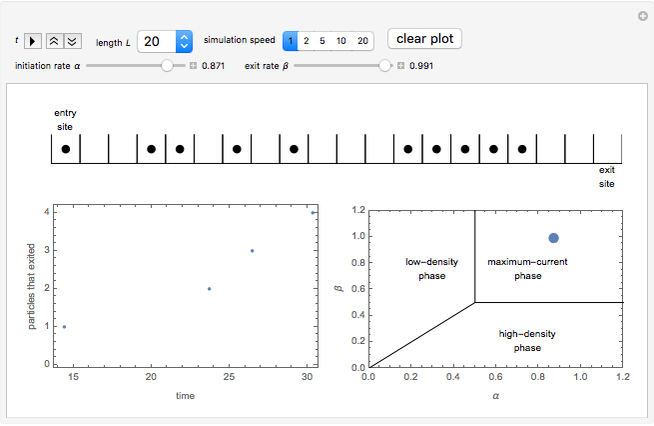 The plot on the left shows the number of particles that exited through the right side of the lattice versus time. Particle current (number of particles/time) is also displayed. 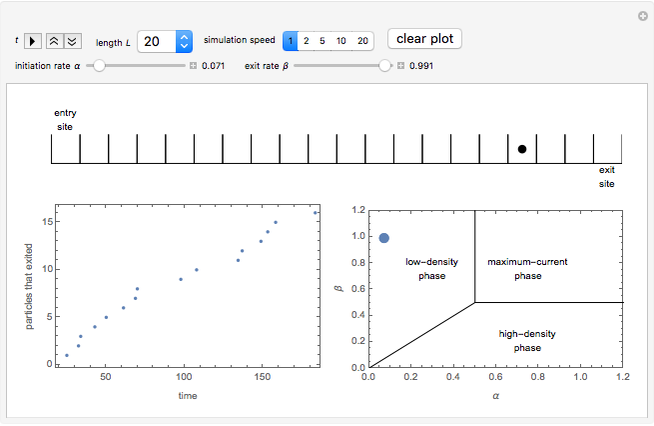 The plot on the right shows the phase diagram of TASEP in the limit as . The low-density phase is characterized by the current , depending only on the entry rate . The high-density phase has , depending on the exit rate . In the maximum-current phase, does not depend on the entry/exit rates. The current position of the system in the phase space is indicated by the blue dot. You can vary the entry and exit rates and to see if the numerically estimated current matches the theoretical values in the three different phases. R. A. Blythe and M. R. Evans, "Nonequilibrium Steady States of Matrix-Product Form: A Solver's Guide," Journal of Physics A: Mathematical and Theoretical, 40(46), 2007 R333. stacks.iop.org/1751-8121/40/i=46/a=R01. B. Derrida, M. R. Evans, V. Hakim and V. Pasquier, "Exact Solution of a 1D Asymmetric Exclusion Model Using a Matrix Formulation," Journal of Physics A: Mathematical and General, 26(7), 1993 1493. stacks.iop.org/0305-4470/26/i=7/a=011. Bartlomiej Waclaw "Totally Asymmetric Simple Exclusion Process (TASEP)"